Home » CONCOMITANT CHEMORADIATION IN LOCALLY ADVANCED CARCINOMA CERVIX: COMPARING DOUBLET VERSUS SINGLE AGENT CHEMOTHERAPY. CONCOMITANT CHEMORADIATION IN LOCALLY ADVANCED CARCINOMA CERVIX: COMPARING DOUBLET VERSUS SINGLE AGENT CHEMOTHERAPY. Purpose: To compare the efficacy and toxicity of two definitive concomitant chemoradiotherapy schedules (doublet combination and single agent) along with radical external beam radiotherapy (EBRT) in the management of locally advanced carcinoma of the uterine cervix (LACCx). Material and method: Previously untreated, 60 patients of LACCx (FIGO stage IIB-IIIB) were taken for definitive treatment by concurrent chemo-radiation. These patients were randomly assigned either; Study group I, the Doublet chemotherapy(Gemcitabine + Cisplatin) administration and Control group II, the Single-agent chemotherapy(Cisplatin) administration group. EBRT was given as 50Gy/ 25Fr/ 5 weeks. Chemoradiation was followed by weekly HDR Intra-cavitory brachytherapy (ICBT), 3 sessions of 700cGy each. Observations were made at the end of treatment and 6 months of follow up. Response to treatment and toxicity were investigated. 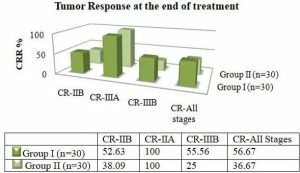 Results: At the end of treatment, disease response in study and control respectively at the end of treatment was as follows: Stage IIB (CR- 52.63% versus 38.09%), Stage IIIA (CR- 100% versus 100%) and Stage IIIB (CR- 55.56% versus 25.0%). Overall disease response for the group I and II, at the end of sixth months follow up was as follows: CR- 93.33% versus 83.33%, PR- 3.33% versus 13.33%, and recurrence- 3.33% versus 3.33% respectively. Most severe acute hematological toxicity observed was Grade 2 in 40.0% versus 16.67% patients, respectively. Similar was the trend of acute skin & mucosal reactions and acute gastrointestinal toxicity. Though a higher number of patients in the study group experienced more acute toxicities, these were acceptable and manageable. Skin and mucosal reactions at 6 months follow up were not significantly higher in the doublet group compared to the single agent group. Conclusion: Administration of doublet combination chemotherapy; is better compared to single-agent chemotherapy administration in terms of disease control (though not statistically significant)with manageable toxicity profile; given concurrent with EBRT, for management of locally advanced carcinoma cervix. A larger study may establish the very role of the new regimen, especially in a resource-limited setup where patients present with advanced/ bulky disease. KEYWORDS: Carcinoma cervix, Chemoradiation, Cisplatin, Doublet, Gemcitabine, Radiotherapy. Asian cancer burden accounts for nearly half of the new cancer cases and more than half of the cancer deaths. Current estimates indicate that in India, every year 96,322 women are diagnosed with cervical cancer and 60,078 die from the disease. Cervical cancer ranks as the 3rd frequent cancer among women in India. Matter of higher concern is that its frequent cancer among women between 15 and 44 years of age and women present for treatment in very advanced stage of the disease. Present study is an effort to address the bulk and burden of disease. Patients between 2014 and 2016, sixty previously untreated, patients of LACCx (stage IIB - IIIB), attending the Department of Radiotherapy, Pt. B.D. Sharma Post Graduate Institute of Medical Sciences, Rohtak (India) were taken up for definitive treatment by concurrent chemo-radiation therapy. The patients had Karnofsky performance status (KPS) >70, hemoglobin >10gm/dl, neutrophil & platelet counts, liver function and renal function tests were within normal range. Chest X-ray and USG abdomen showed no evidence of metastasis. The study was carried out after due approval of the institution’s ethics review board. Patient characteristics are shown in Table 1. All patients were planned for radical radiotherapy with Cobalt teletherapy machine. Intended radiation treatment for each patient was 50Gy in 25 fractions over 5 weeks (one daily fraction of 200cGy, 5 fractions per week). Weekly, HDR Intracavitory brachytherapy (ICBT), 3 sessions of 700cGy each was to follow EBRT. Each patient was to receive weekly concomitant chemotherapy during EBRT- either a doublet regimen using Cisplatin + Gemcitabine (Study Group/ I) or a single agent regimen using Cisplatin only (Control group/ II). Weekly dosage of Gemcitabine and Cisplatin used was 125mg/m2 and 40mg/m2 respectively. The patients were assigned group randomly (by draw of lots). Complete hemogram, liver and kidney function tests were done before every cycle of chemotherapy. Chemotherapy was withheld in cases of any grade 2 or more hematologic, hepatic or renal toxicity, till the normal values were regained after specific management. Observations were made at the end of treatment, and 6 months of follow up. Response for the purpose was determined by clinical examination. Radiological examination, fine needle aspiration cytology or biopsy was carried out in clinically suspicious cases. Patients were monitored weekly for disease response and for acute hematological, skin, mucosal & gastrointestinal toxicity. Patient’s weight was also recorded weekly to assess nutritional status. Acute toxicities were scored using RTOG criteria. Response & maximum toxicity was recorded at the end of treatment. Patients were monitored monthly for disease response and for late skin & mucosal toxicity. Toxicity was scored using RTOG criteria. Response & maximum toxicity was recorded at the end of follow up i.e. 6 months. Senior radiation oncologists in the department reviewed the records periodically and also conducted examination of the patients at random to verify findings of response & toxicity. This was a randomized trial with 1:1 allocation by draw of lots. Frequency tables with counts and percentages were used to describe pre-treatment and treatment characteristics for each group. The categorical clinical characteristics between the two treatments were compared. For continuous variables, mean and/ or median values were compared between the groups. Endpoints included disease response and acute & late toxicities. Subgroup analysis was carried out on various prognostic variables. Data were analyzed using SPSS v20.0 software. The p-value of ≤0.05 was considered as statistically significant. 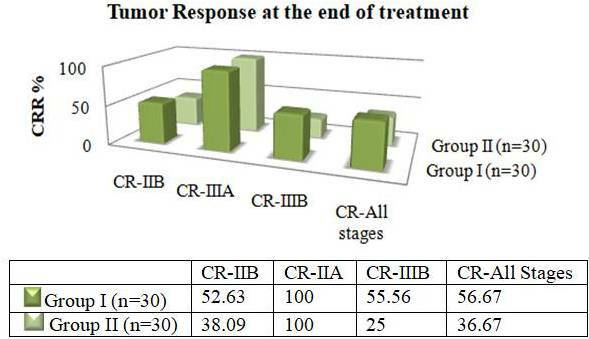 Stage-wise disease response in study and control groups respectively is shown in Figure 1. 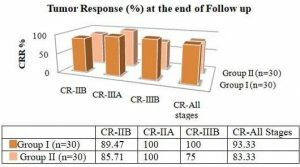 Complete response (CR) was- 52.63% versus 38.09% for stage IIB, 100% for stage IIIA in each group and 55.56% versus 25% for stage IIIB respectively. For all stages, CR was 56.67% versus 36.67% in group I and II respectively. Tumor response was not significantly different in the two groups with respect to age distribution, rural/ urban distribution, histopathological distribution, stage-wise distribution and treatment interruption. Hematological toxicity (WHO criteria) observed in study group and control group respectively at the end of treatment was as follows: Anemia- Grade 0 in 1 (3.33%) versus 13 (43.33%), Grade I in 17 (56.67%) versus 12 (40%), Grade II in 12 (40%) versus 5 (16.67%); TLC toxicity- Grade 0 in 10 (33.33%) versus 25 (83.33%), Grade I in 11 (36.67%) versus 4 (13.33%), Grade II in 6 (20%) versus 1 (3.33%). Difference in hematological toxicities was statistically significant between two groups (p < 0.05). The worst acute skin reactions observed during treatment and by the end of treatment in Group I and II respectively were: Grade I in 14 (46.67%) versus 16 (53.33%), Grade II in 10 (33.33%) versus 8 (26.67%), Grade III in 6 (20%) in Group I only. Difference in Grade III skin toxicity was statistically significant (p < 0.05). The worst acute mucosal reactions observed in Group I and II respectively were: Grade I in 15 (50%) versus 17 (56.67%), Grade II in 11 (36.67%) versus 2 (6.67%), Grade III in 3 (10%) in group I only. Difference in Grade II mucosal toxicity was statistically significant between two groups (p<0.05). Upper Gastrointestinal toxicity observed in study and control group was as follows: Grade 0 in 10 (33.33%) versus 18 (60%), Grade I in 11 (36.67%) versus 9 (30%), Grade II in 6 (20%) versus 3 (10%), Grade III in 3 (10%) in group I only. Lower gastrointestinal toxicity observed in study and control group was as follows: Grade I in 6 (20%) versus 9 (30%), Grade II in 4 (13.33%) versus 2 (6.67%), Grade III in 2 (6.67%) in group I only. Difference in upper and lower gastrointestinal toxicity was not statistically significant. No significant weight loss was observed in both the groups. Treatment interruptions, for more than a week, due to acute toxicities were observed in 5 (16.67%) versus 3 (10%) patients in study and control group, respectively. Stage wise disease response in study and control groups respectively is shown in Figure 2. Complete response at the end of 6 months was seen in 93.33% and 83.33% of the patients in group I and group II respectively while the partial response was seen in 3.33% and 13.33% patients in group I and group II respectively. Recurrence occurred in one patient (3.33%) in each group at sixth month. Earliest recurrence was noted in 6th follow up in both group I and II respectively. Late radiation toxicity in the study and the control group respectively was as follows: Cutaneous toxicity- Grade 0 in 10 (33.33%) versus 21 (70%), Grade I in 17 (56.67%) versus 7 (23.33%), Grade II in 3(10%) versus 2(6.67%); Subcutaneous toxicity- Grade 0 in 10 (33.33%) versus 19 (63.33%), Grade I in 17 (56.67%) versus 9 (30%), Grade II in 3 (10%) versus 2 (6.67%); Mucosal toxicity- Grade 0 in 23 (76.67%) versus 26 (86.67%), Grade I in 7 (23.33%) versus 4 (13.33%). In patients with residual disease, recurrence, or progression of disease, salvage surgery, chemotherapy or palliative treatment was offered, depending on patient’s condition, disease status, symptoms and prior treatment received. This study intends to address oncological burden of disease in females that is cervical carcinoma especially in the patients with bulky (locally advanced) disease. This is an effort to compare potentially better doublet concurrent chemotherapy regimen with the standard single agent Cisplatin concurrent chemotherapy regimen, for the management of locally advanced squamous cell carcinoma of uterine cervix. Treatment was interrupted in six patients (20%) of group I due to severe reactions or hematological toxicities whereas in group II, treatment was interrupted in two patients (6.67%) due to non-compliance and logistic issue. These patients took more than six weeks to complete EBRT. However, radiation dose because of interruption was compensated by gap correction in either group. Grade II acute skin reactions were seen in 33.33% and 26.67% of the patients in group I and group II, respectively. Grade III skin reactions were seen in 20% of the patients in group I in the 4rd week. None of the patients developed grade IV skin reactions. The difference in the two groups was statistically significant for grade III radiation induced skin toxicity. Acute mucosal toxicity of grade II was seen in 23.33% of patients in group I and 43.34% in group II respectively. Acute grade III mucosal toxicity was seen only in group I (10%) in the 4th& 5th week. The difference in the two groups was statistically significant for grade II radiation induced mucosal reaction. Taking into consideration the effectiveness and ease, this study has brought forth the relevance of conducting such a trial and has shown that existing standard of care may further be explored to get better without adding much cost, especially in patients with locally advanced disease attending infrastructure constraints set up. Administration of doublet combination chemotherapy; is better compared to single agent chemotherapy administration in terms of disease control (though not statistically significant) with manageable toxicity profile; given concurrent with EBRT, for management of locally advanced carcinoma cervix. A larger study may establish the very role of new regimen, especially in resource limited setup where patients present with advanced/ bulky disease. Ferlay J, Colombet M, Soerjomataram I, et al. Global and regional estimates of the incidence and mortality for 38 cancers: GLOBOCAN 2018. Lyon: International Agency for Research on Cancer/World Health Organization; 2018. Thulaseedharan J, Malila N, Hakama M, Esmy P, Cheriyan M, Swaminathan R, et al. Socio-demographic and reproductive risk factors for cervical cancer- a large prospective cohort study from rural India. Asian Pacific J Cancer Prev. 2012;13:2991-5. World Health Organization. The global burden of disease. Geneva: World Health Organization; 2008. Site wise distribution of cancer: Data for the year 2015, Retrieved February 2016 from Radiotherapy OPD Record Section, Pt. B. D. Sharma UHS, Rohtak. Satija A. Cervical cancer in India, South Asia Centre for Chronic Disease WHO, 2009b; GLOBOCAN 2002 database, (IARC)6-26 . Viswanathan A.Uterine Cervix. In: Halperin EC, Perez CA, Brady LW, editors. Principles and Practice of Radiation Oncology 6thed. Philadelphia PA: Lippincott Williams and Wilkins; 2013. p. 1355-424. Ellenson LH, Pirog EC. The Female Genital Tract. In: Kumar V, Abbas AK, Fausto N, Aster JC, editors. Robbins and Cotran Pathologic Basis of Disease. New York: Elsevier; 2010. p. 1005-63. Kato S, Ohno T, Thephamongkhol K,Chansilpa Y,Cao J, Xu X, et al. Long-term follow-up results of a multi-institutional phase II study of concurrent chemoradiation therapy for locally advanced cervical cancer in east and southeast Asia. Int J RadiatOncolBiol Phys. 2013;87(1):100-5. Vale CL. Chemoradiotherapy for Cervical Cancer Meta- Analysis Collaboration (CCCMAC): Reducing uncertainties about the effects of chemoradiotherapy for cervical cancer: Individual patient data Meta-analysis. Cochrane Database System Revv1: CD 008285,2010. King M, McConkey C, Latief TN. Improved survival after concurrent weekly cisplatin and radiotherapy for cervical carcinoma with assessment of acute and late side effects. J ClinOncol. 2006;18:38-45. Petrelli F, De Stefani A, Raspagliesi F, Lorusso D, Barni S. Radiotherapy with concurrent cisplatin-based doublet or weekly cisplatin for cervical cancer: A systemic review and meta- analysis. GynecolOncol. 2014;134(1):166-71. Roy S, Devleena, Maji T, Chaudhuri P, Lahiri D, Biswas J. Addition of gemcitabine to standard therapy in locally advanced cervical cancer. Indian J Med PaediatrOncol. 2011 Jul- Sep;32(3):13. Dueñas-González A, ZarbáJJ, Patel F, Alcedo JC, Beslija S, Casanova L, et al. Phase III, open-label, randomized study comparing concurrent gemcitabine plus cisplatin and radiation followed by adjuvant gemcitabine and cisplatin versus concurrent cisplatin and radiation in patients with stage IIB to IVA carcinoma Cervix. J ClinOncol. 2011;29(13):1678-85. Umanzor J, Aguiluz M, Pineda C, Andrade S, Erazo M, Flores C, et al. Concurrent cisplatin/gemcitabine chemotherapy along with radiotherapy in locally advanced cervical carcinoma: a phase II trial. J GynecolOncol. 2006;100(1):70-5. Zarbá JJ, Jaremtchuk AV, Gonzalez Jazey P, Keropian M, Castagnino R, Mina C, et al. Phase I-II study of weekly cisplatin and gemcitabine with concurrent radiotherapy in locally advanced cervical cancer. Ann Oncol. 2003;14(8):1285-90. Verma AK, Arya AK, Kumar M, Kumar A, Gupta S, Sharma D, et al. Weekly cisplatin or gemcitabine concomitant with radiation in the management of locally advanced carcinoma cervix: results from an observational study. J GynecolOncol. 2009;20(4):221-6. Dueñas-González A, Cetina-Perez L, Lopez-Graniel C et al. Pathologic response and toxicity assessment of chemoradiotherapy with cisplatin versus cisplatin plus gemcitabine in cervical cancer: A randomized Phase II study. Int J Radiation OncolBiolPhys 2005;61:817-23. Eifel PJ, Winter K, Morris M, Levenback C, Grigsby P,Cooper J. Pelvic irradiation with concurrent chemotherapy versus pelvic and para-aortic irradiation for high risk cervical cancer: an update of radiation therapy oncology group trial (RTOG) 90-01. J ClinOncol. 2004;22:872-80. Maduro JH, Pras E, Willemse PH, de Vries EG. Acute and long-term toxicity following radiotherapy alone or in combination with chemotherapy for locally advanced cervical cancer. Cancer Treat Rev. 2003;29(6):471-88. Authors Address: Dr. Yashpal Verma, Additional Senior Medical Officer, Department of Radiation Oncology, PGIMS Rohtak (India).